This is the first compilation album issued by Music Maker Recordings, released a few years before Taj Mahal and the Winston Blues Revival tours helped put the Music Maker Relief Foundation on the map as one of the rootsiest (and hippest) blues nonprofits around. 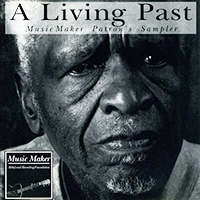 A Living Past is a mix of remastered by Mark Levinson, contemporary field recordings of Piedmont blues, country ditties, and spoken word -- or, as producer Timothy Duffy puts it in the liner notes, "songs from a front porch or nursing home that will never happen again. "Of particular note are the tracks that kicked off Guitar Gabriel's second comeback (his first was in 1970) and the only modern-era recordings by singer/guitarist Preston Fulp.Like the prewar field recordings done by Alan Lomax, this collection gives equal attention to traditions both popular ("Careless Love," "I Got a Woman") and obscure (Captain Luke's weirdly compelling "Kingfish Story"). Before you go diving into the Roots n' Blues reissues on Columbia, you might want to give this one a try, especially since some of these performers are still going strong.